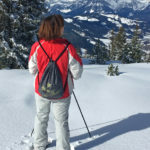 All too often when I visit Switzerland in the winter, it’s part of a mad dash through Geneva airport, usually struggling under the weight of skis and ski boots, straight into a minibus and off to the mountains and the ski chalet. Or in the summer, more often than not, it’s a mad dash through the EuroAirport and Basel train station to catch a train to Interlaken or Zermatt to do some summer mountain hiking. In fact, the only time I had ever stopped over for the night in Basel was when I was in transit from Munich to London and the airline (who shall remain nameless!) decided that I had cancelled my ticket from Basel to London and refused to board me. After missing the flight and a lot of arguing they grudgingly agreed that the mistake was theirs and put us up in a hotel for the night. Let’s just say that it was not the best introduction to the city! So when I had the opportunity to spend a festive winter weekend there, I was keen to rewrite my impression of the city and get to know it under friendlier and more relaxed circumstances. 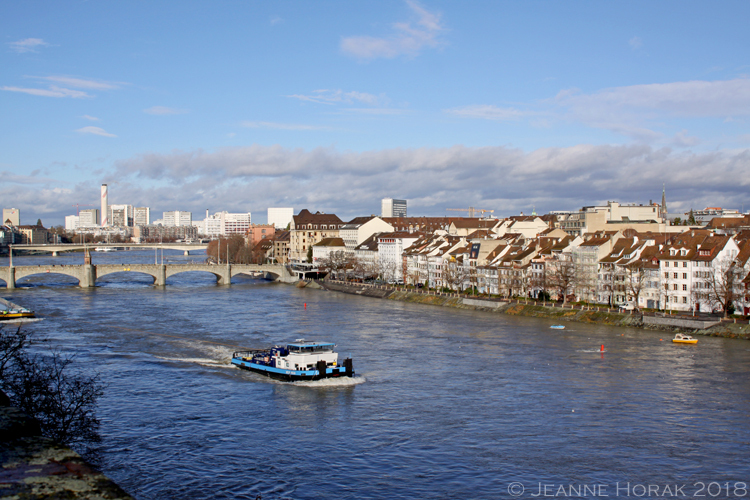 Basel is the 3rd largest city in Switzerland, located in the north-west where the Swiss, French and German borders meet, and the city also has suburbs in France and Germany. Leave your French at home though – the predominant language here is Swiss German. The fact that Basel has been a commercial hub and important cultural centre since the Renaissance is still very much in evidence totay: it is home to Switzerland’s oldest university and largest art museum, as well as being a world centre for the pharmaceuticals industry. It’s a city of two halves, bisected neatly by the Rhine river, with the Old Town on one bank and Kleinbasel on the other – historically a more downmarket side of the ciry but today a hip and happening mix of bars and restaurants, aod lovely views across the Rhine at the Old Town. Getting around Basel could not be easier as there is an extensive public transport network comprising trams, buses and trains. As a visitor at a registered hotel in Basel, at check-in you are issued with a Basel Card which allows you to use public transport free of charge anywhere in the city of Basel and its surroundings (including EuroAirport) for stays of up to 30 days (as well as free wifi and museum discounts). WIth free public transport it seems rude not to explore the city – so here are some ideas of what to do with your winter weekend in Basel. I always like to orientate myself in a new city before setting out to explore on my own and a great way to get your bearings is to do a walking tour of the city. That was how we kicked off our weekend in Basel, taking a guided stroll through the old town looking at the beautiful architecture while hearing about the history of the city. We met our guide at the Tinguely Fountain, named for Jean Tinguely, a Swiss artist who in 1977 lined a shallow fountain with black asphalt and added nine mechanical iron figures powered by low-voltage current who appear to be playing in the water. The constant motion and “interaction” between the figures echoes the mime artists, actors and dancers that once occupied the theatre that once stood here. 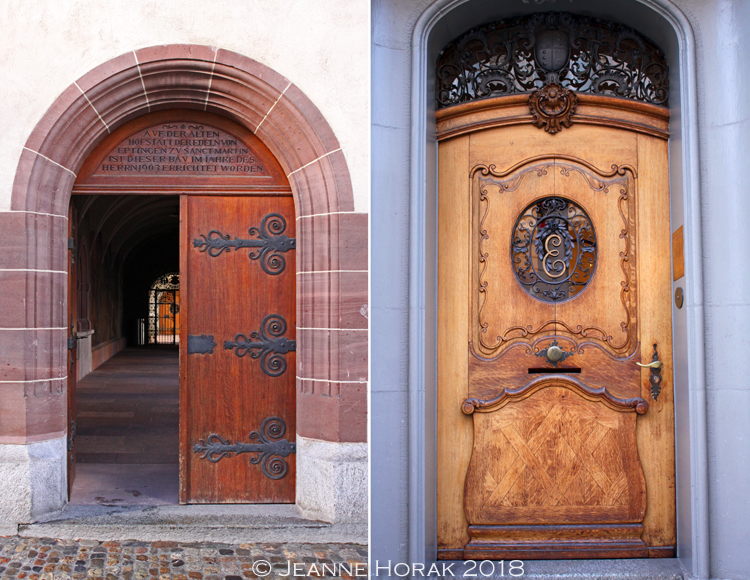 From there, our stroll took in a number of Basel’s landmarks, squares, elegant streets and doorways. The Basel Museum of Cultures in Basel was founded in 1894 on the site of a former Augustinian monastery in the Mediaeval heart of Basel and is housed in a neoclassical building designed by Melchior Berri. As the collection grew, an additional wing was built into the courtyard and more recently this has been topped by an extra storey with a gleaming “folded roof” by architects Herzog & de Meuron. The contrast between it and the Basel Minster that towers over it is a great example of how modern and classical architecture can coexist in harmony. Nearby Andreasplatz is a tranquil square in the old town, featuring a tinkling fountain topped with a most unusual statue of a monkey wearing a hat and eating a bunch of grapes. It also features probably the best graphics for any public loo that I have ever seen. anywhere! Who knew how quirky the traditionally staid Swiss could be?? 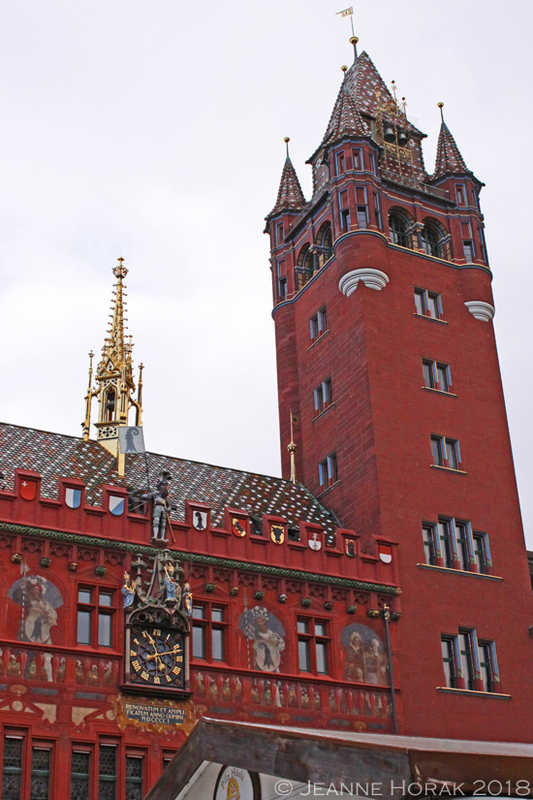 The Basel Rathaus (City Hall) is a magnificent 500 year old building that dominates the city’s Markplatz. The striking red sandstone building was completed in the 16th Century (although the impressive tower was only added in the 19th cewntury) and is still still the seat of government for the Canton of Basel-Stadt. Although the exterior is impressive, it is definitely also worth booking a tour of ths interior to see the courtyard frescoes; the beautifully painted vaulted ceilings; the wood-panelled meeting rooms and the vies of the gilded spire and multi-coloured ceramic tile roof from the top of the building. Barfüsserplatz (literally “barefoot square”) is named after the barefoot Franciscan friars who founded the Barfüsserkirche on the square in the 14th century. Today the handsome square is surrounded by shops and restaurants in the narrow lanes surrounding it. 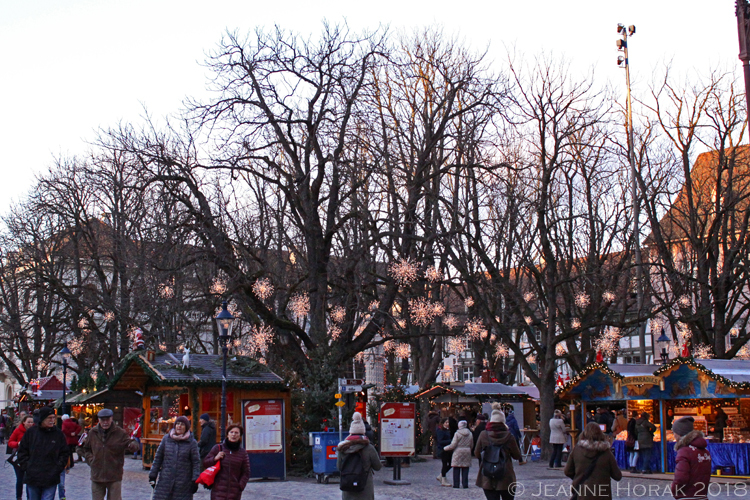 On Thursdays there is a flea market there, but over November and December, it is home to a large portion of the Basel Christmas market (but more about that below!). Our tour ended at the Basel Minster, a magnificent red sandstone cathedral built between 1019 and 1500 in Romaneqsue and Gothic styles, on the foundations of older churches on the same site. The building as it stands today dates back for the most part to the late Romanesque building constructed in the last third of the 12th century and completed around 1225. Even though the structure was supported by massive pillars, Basel’s 1356 earthquake destroyed five towers, the choir and various vaults. The cathedral was rebuilt and reopened in 1363 – make sure you step inside to see the magnificent vaulted ceilings. The adjacent Munsterplatz is home to another part of Basel’s extensive Christmas market over the festive season, but don’t forget to walk around behind the cathedral from where you can enjoy a wonderful panoramic view over the Rhine and Kleinbasel (the name for the half of the city on the opposite bank of the river). Basel Tourism offers daily walking tours of the Basel Old Town from 14h30-16h30. Tours cost 20 CHF and can be booked online. Basel is home to a number of museums – some fairly traditional and some fairly niche. The Natural History Museum focuses on the plant and animal kingdom from he age of fossils and dinosaurs, all the way to modern-day Swiss wildlife. The Kunstmuseum (fine art museum) houses an impressive art collection, stretching from Hans Holbein the Younger and Albrecht Durer through the Impressionists and post-Impresionists all the way to Mondrian, Warhol and Calder. The Museum of Cultures focuses on ethnography with large and important collections of artifacts, especially from Europe, the South Pacific, Mesoamerica, Tibet, and Bali. But on the more niche side there is also the Spielzeug Welten (Toy Worlds) Museum, the largest museum of its kind in Europe featuring 6,000 toys spread over four floors, not arranged based on time period, subject or origin but rather as if the toys are interacting with each other. The museum’s collection includes doll houses and shops, miniatures, carousels, and an entire floor dedicated to teddy bears dating back to 1904. The quirky Hoosesagg (Trouser Pocket) Museum ois situated on a steep street in Basel’s old town. But when you reach the museum’s address the door to 31 Imbergässlein does not open – because the door itself is a museum! The home owners had grown tired of passers-by peering through the glass of their front door and decided to give them something to look instead. Behind the glass pane in the door there is now a lit display cabinet where a selection of random small items are displayed. An “exhhibition” can be changed in a matter of munutes and in the past the museum has exhibited miniature fire engines, storks, planes, Fiat 500s and even a special Football World Cup exhibition in 2014. The Fondation Beyeler is situated in the suburb of Riehen, an easy 30 minute tram ride from the centre of Basel, and was one of the best museums I have ever visited – a combination of the beautifully designed building; the fact that it was relatively uncrowded; and the fact that they had an exhibition of one of my favourite artisis, Paul Klee. The musem was founded in 1997 by Ernst Beyeler and his wife Hildy Beyeler, who had started their private art collection while they owned an antiquarian bookstore in Basel in the 1950s. Over the course of nearly 50 years they amassed an impressive collection of classical modernist pieces reflecting their taste and representing some of the greatest artists of the time. The collection was first publicy exhibited in Madrid in 1989 and in the couple subsequently commissioned renowned architect Renzo Piano to create a gallery as a permanent home for their art. His magnificent building provides a clean and tranquil space in which the art is the star, and the beautiful gardens outside seem to flow into the rooms through the floor to ceiling windows. The original collection has been carefully expanded to over 250 works since its first exhibition and provides a comprehensive overview of 20th century art, including 23 Picassos, 20 Paul Klees, and works by Monet, Cezanne, Van Gogh, Roy Lichtenstein, Francis Bacon and more. A third of the museum’s exhibition space is reserved for special exhibitions staged to complement the permanent collection and the exhibition when I visited was by Paul Klee – over 100 of his exquisite works on loan from various international museums and institutions. This fabulous exhibition as well as one of Monet’s monumental Waterlillies canvases were my highlights – but I could easily have stayed there all day. Open every day – but please check times in advance! Monday to Sunday from 10 a.m. to 6 p.m.
Wednesday from 10 a.m. to 8 p.m.
One of the things that I grew to love very early on after moving to the UK was the annual Christmas merkets that almost every European city hosts. The first one I experienced was in Cologne in December 2000 and I have been hooked ever since! One whiff of mulled wine and roasting chestnuts and I am in heaven! 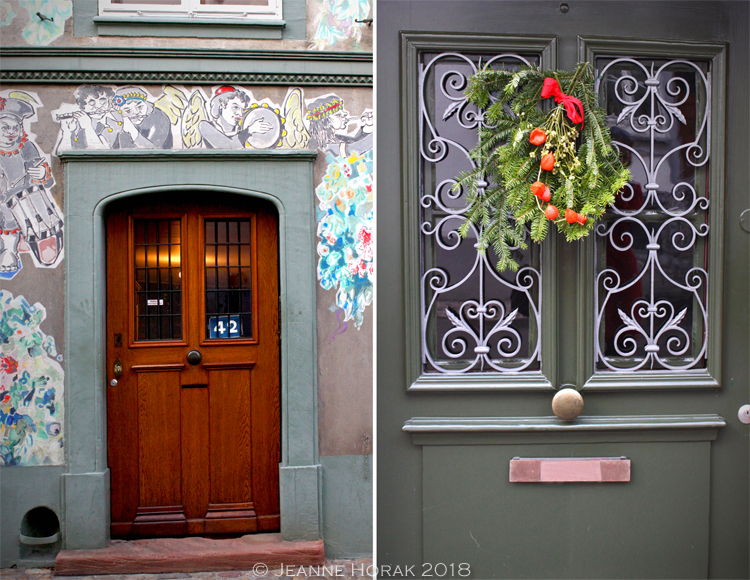 I was thrileld to discover that the Basel Christmas makrets are amongst the largest and prettiest in Switzerland, if not Europe. 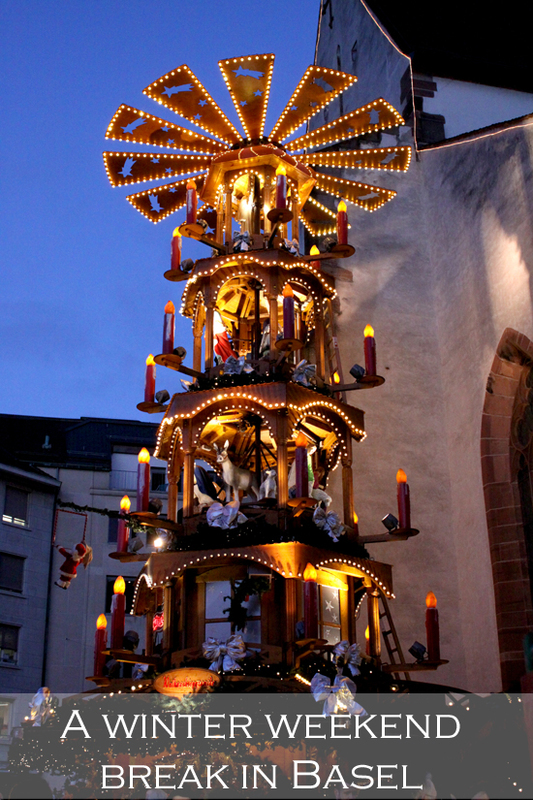 There are three main parts to the Basel Christmas markets, spread across Münsterplatz and Barfüsserplatz in the old town, with a smaller one across the river in Kleinbasel at Claraplatz. Stalls also spill into the surrounding streets so it never really feels like you are leaving the market as you walk around the city. 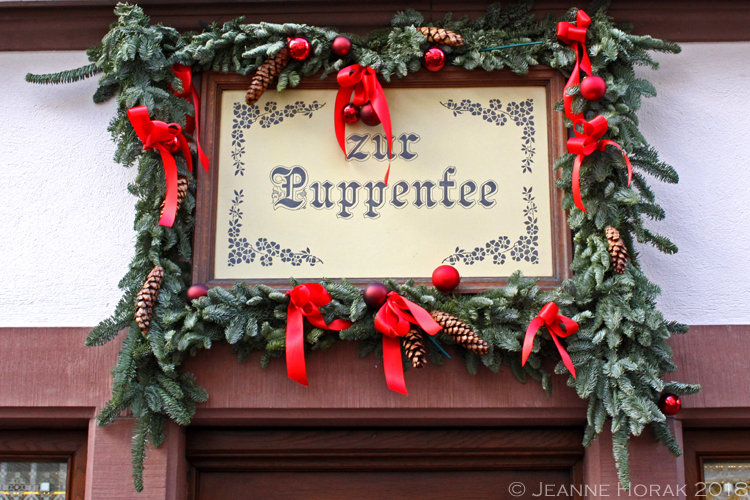 There are over 180 stalls selling local artisan products and gifts as well as plenty of food and drink including crepes, waffles, sausages of every description, raclette, Basel Läckerli (a traditional Swiss gingerbread), waffles Flammkuchen (a cheesy flatbread) and of course glüwein a-plenty! I am told the place to see and be seen with your hands wrapped around a commemorative boot-shaped glüwein mug is in the bar at the base of the carousel tree on Barfüsserplatz. There is a CHF4 deposit on the mugs that you are refunded when you return them. 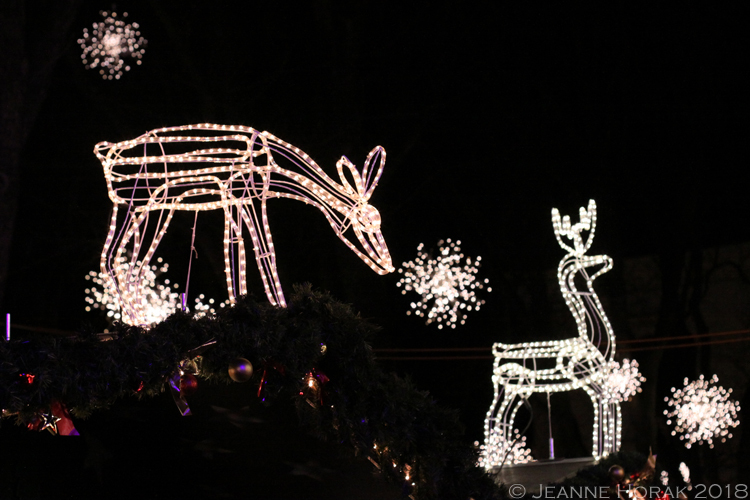 And if you have still not had your fill of Christmas, check out the nearby streets and squares for their beautiful Christmas lights – the whole city positively sparkles! My favourite street in the old town had to be Spalenberg street which is full of the quaintest shops. 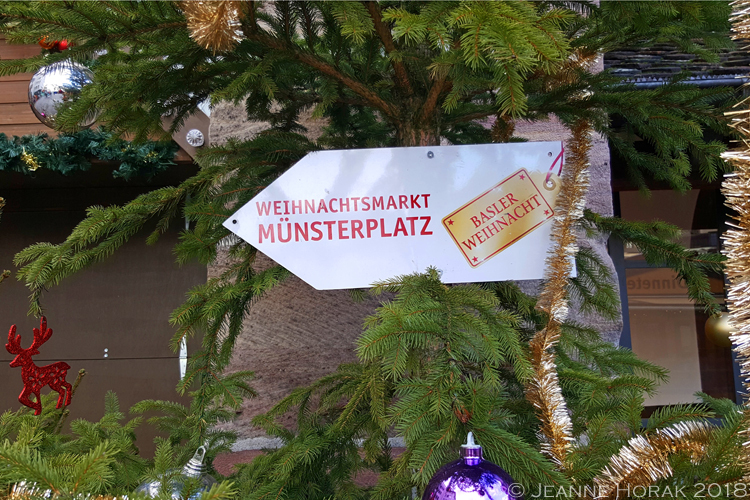 At no.14 Spalenberg you will find another Basel landmark – the Johann Wanner Christmas House. 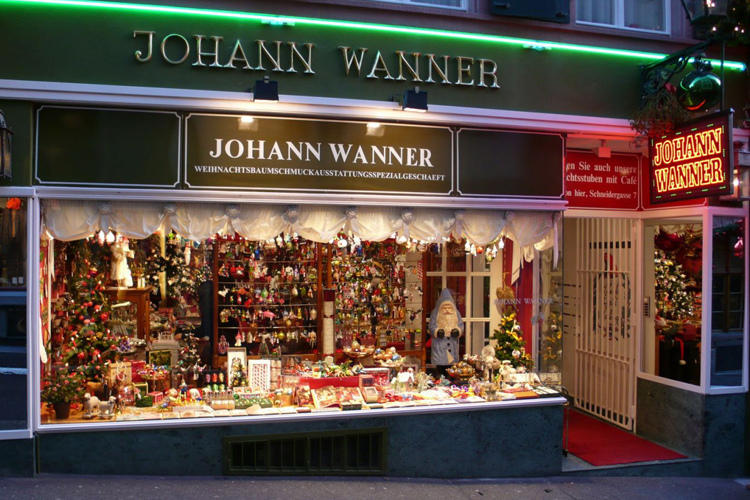 This shop was founded in the 60s by Johann Wanner, selling simple blown glass Christmas baubles, and over the years it has grown into arguably the most famous Christmas bauble shop in the world, supplying the White House, the Vatican and the Queen of England. Stepping inside is a bit like stepping into Alladdin’s cave… as you walk the shop just goes on and on and on – and every corner glitters with the most amazing selection of Christmas baubles of every shape and size. The decorations are mostly arranged by colour and there is a blown glass bauble for pretty much any niche interest group you can think of – think Imperial Storm Troopers, footballs, lobsters and more. My particular favourite was their collection of food and drink related baubles… burger bauble, anyone? Or maybe an avocado ornament? The best thing is that the shop is open year round, so even if you cannot be in Basel at Christmas, you can still get into the Christmas spirit. 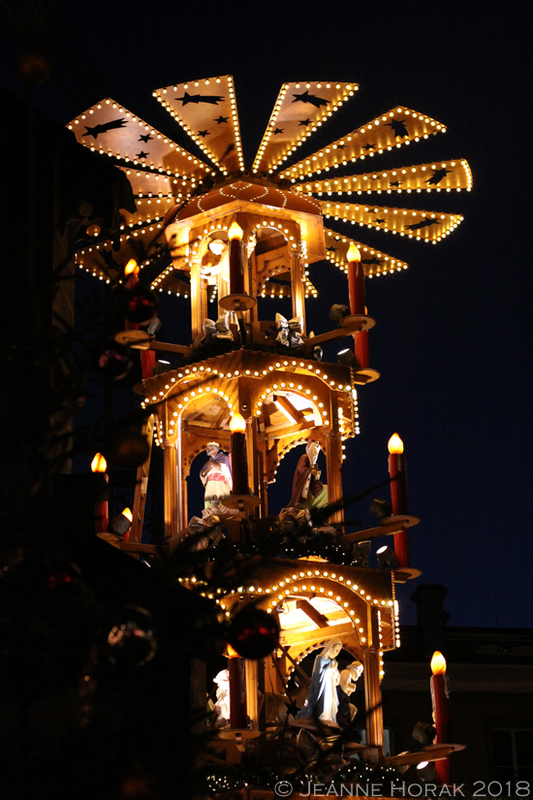 The Basel Christmas markets generally run from about 23 November to 23 December and are open daily from 11 am to 8.30 pm. At Rubino, chef Manuela Buser describes her food as “a healthy, creative cuisine” and the menu features refined Mediterranean delicacies as well as more hearty Swiss dishes. Dishes are prepared using organic, seasonal produce from the local region as far as possible and the menu changes every day. The restaurant offers only a “surprise menu” rather than an a la carte, meaning that diners can choose between two or five courses; and between a meat, fish or vegetable-based menu – or mix all three. Once you have made those two choices, the rest of the meal is a delightful surprise. 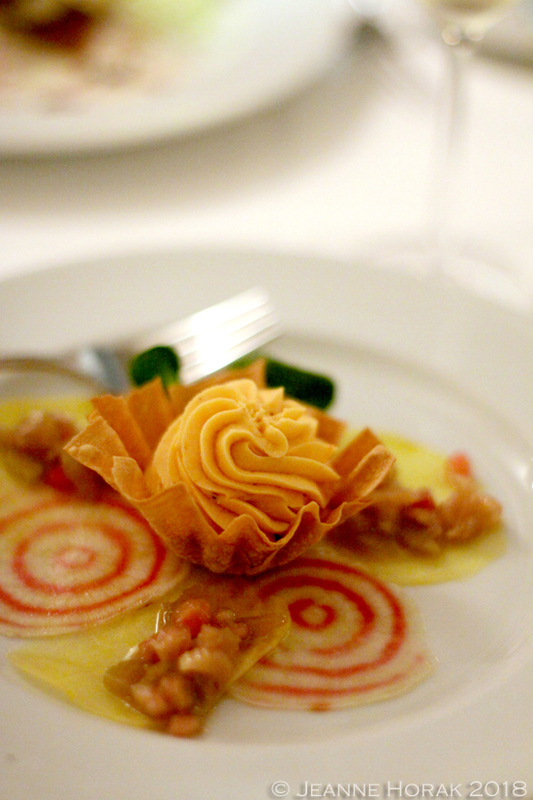 There is also the option of adding a wine pairing for each dish, chosen by Manuela’s co-host Beat Rutbischung. Tuesday – Saturday 6 p.m. to 11.30 p.m.
After a morning’s walking around the city and shopping at the Munsterplatz Christmas market we stopped in at the Wacker Fonduestubli, a pop-up traditional Swiss fondue hut that opens for the duration of the Christmas market in Nov/Dec. The cosy interior provided the perfect respite from the bright but chilly weather and the perfect place to enjoy a traditional Swiss favourite: cheese fondue! There were squeals of delight all round when the big bubbling pot of melted Gruyere, Emmental and Appenzeller cheese was put in front of us and within minutes we were all enthusiastically coating our bread cubes in cheesy goodness, washed down with (you guessed!) more glühwein. We also sampled a traditional Swiss dessert of meringues and whipped cream – deliciously decadent. If fine dining is not your thing but you are after some hearty traditional Swiss food, do what we did and head to Eintracht in Kleinbasel, a local restaurant that is very much off the tourist track and serves a very traditional Swiss menu. The restaurant was founded in about 1900 and is apparently the original home of the record-breaking largest cordon bleu schnitzel in the world – a whopping 143kg! There is still a hint of that in the menu, with a 1kg cordon bleu available to brave diners. We stuck to more traditional portions but even my schnitzel with fries was massive and filled with a veritable lake of Gruyere cheese, for a mere CHF25! Rosana had a similarly enormous creamy mushroom schnitzel with noodles for CHF29 – definitely a good bargain. It’s a great place for those dining on a budget and it’s packed with locals. If massive portions of meat stuffed with cheese is not your thing, then 1777 Kaffee is just the place for you. This buzzy modern café is situated on the tranquil and secluded Schmiedenhofplatz in the old town, adjacent to the Basel Library. The menu is somewhat unusual – during the week their menu only features three options: build your own baguette, salad, or charcuterie plate. You get tickbox menus, dim sum style, choose the basics (breads, cheeses, meats, garnishes) and then customise from there A brilliant idea! Over the weekend they also serve burgers, pastrami sandwiches and gourmet hot dogs, and there is always an excellent selection of coffees and drinks (alcoholic and non-alcoholic) available. Clockwise from bottom right you have Rosana’s charcuterie platter; Chris’s amazing smoked sausage and crispy onion hot dog; and my salad with bacon, mozzarella, olives and croutons. All delicious and generously sized! The EuroAirport (serving Basel, Mulhouse and Freiburg) is only a 15 minute bus ride from Basel central train station and both EasyJet and British Airways offer daily direct flights from London (1h30m). Basel’s three mainline train stations offer excellent connections to all Swiss cities and major European cities. The Swiss Railway station (SBB), the French Railway station (SNCF) and the Badische Bahnhof, operated by German Railway (DB), are all conveniently located in the heart of the city. While in Basel we stayed at the brand new Hotel Ibis Styles Basel City on Grosspeterstrasse. The modern, bright, air-conditioned rooms decorated with fresh colors, offer a flat-screen TV and wonderfully comfortable Ibis Styles Sweet Bed. The lopbby is bright and modern and there is always free tea, coffee and water available. The hotel’s central location, only a few minutes’ walk from the Basel SBB train station, is a bonus and a nearby tram stop makes it easy to get into the citry centre to see the sights. Rooms in December 2019 start from £155 for a double room per night, including a generous breakfast. 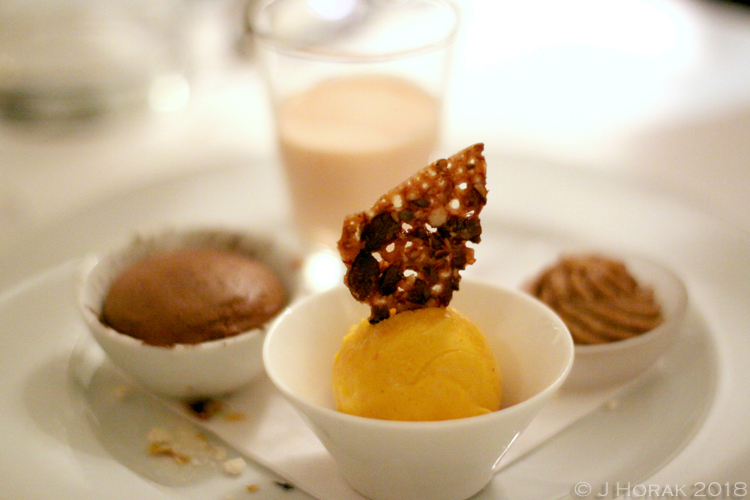 DISCLOSURE: I visited Basel as a guest of Basel Tourism but received no further remuneration to write this post. 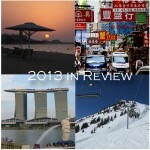 I was not expected to write a positive review – all views are my own and I retain full editorial control. Pin this post to your Pinterest boards to keep for later! You can also find me tweeting at @cooksisterblog, Instagramming as Cooksister, and pinning like a pro on Pinterest. To keep up with my latest posts, you can subscribe to my free e-mail alerts or like Cooksister on Facebook. All the photos were blank! I would love to see them! Thanks, they are there now. Wish I could visit! Sounds like a fascinating city. Worth going for the museums alone. Lovely pics Jeanne. Oh I had SUCH menu envy when I saw that hot dog…!! 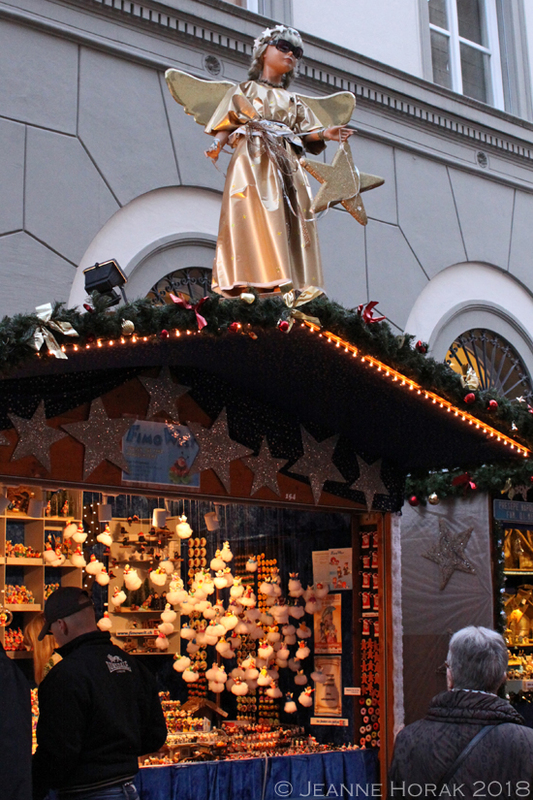 The Christmas markets were fab – definitely a Christmas recommendation and you can usually get cheap flights! ok so you found a VERY special jeanne posing spot here! a Throne no less! That Octopus carpaccio does look special. Like you I’ve never really taken the time to look round Basel. Need to change that…another one for the list! Hahaha – when I saw that throne I just KNEW it was crying out for a “Jeanne” pose 😉 And I would defeinitely recommend Basel for a weekend break! I have always wanted to visit Switzerland, but have never had the chance to. I’m so glad to have this opportunity to see the place through your eyes. Thanks, mate! We should do another trip together!